With mortgage interest rates beginning to drop after what was a volatile year in 2018, many homeowners believe that now is not the time to refinance their current home loan. But the truth is, securing a lower rate is only one of many reasons why homeowners refinance. 1. Do I want to keep paying Mortgage Insurance? If you currently have an FHA loan, you may want to consider refinancing into a Conventional option, which no longer requires Mortgage Insurance once you’ve paid your loan down to 80%. 2. Do I currently have an Adjustable Rate Mortgage (ARM)? True to its name, an ARM is a home loan with an interest rate that can change periodically, causing monthly payments to go up or down. Refinancing into a fixed rate loan may help you lock in a lower payment for the future. 3. Do I want to repair or renovate? If so, a Cash-Out Refinance may be a good option this fall. By borrowing against your current home equity, you can get cash to pay for home remodeling. 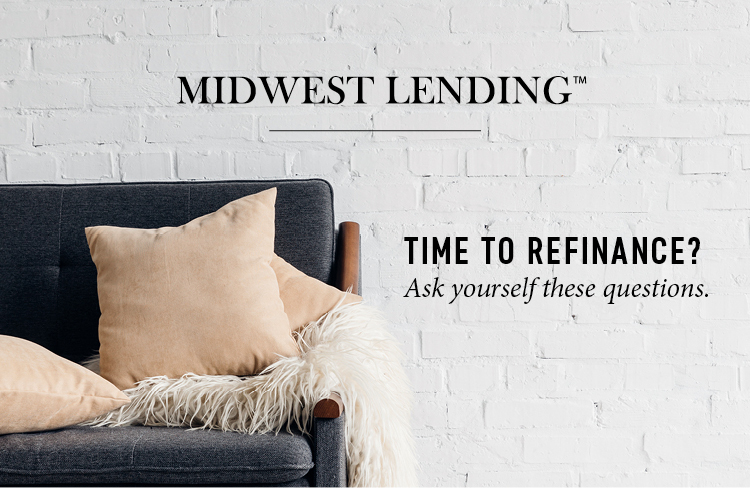 Call or email Midwest Lending today, to see if a refinance is part of your 2019 financial picture!